May 26, 2017 - Forestry tires are expensive. Take some simple, common-sense precautions to protect your investment and get the most service life and maximum safety out of your tires. 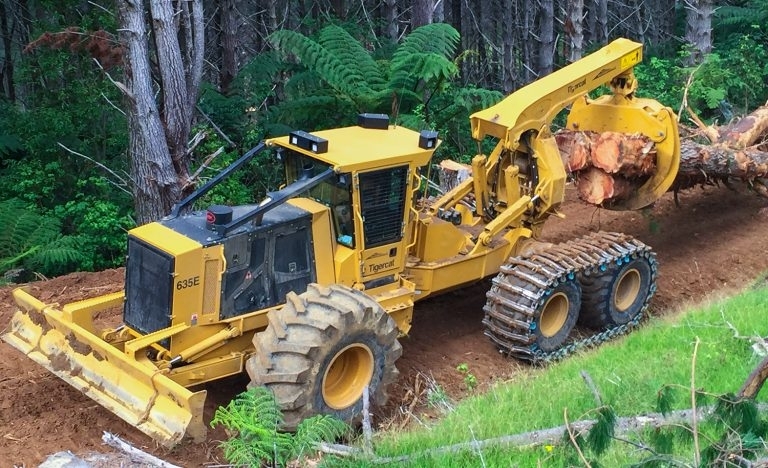 Forestry-duty rubber tires are a big investment for logging operators. A set of tires for a four-wheeled skidder can cost upwards of $12,000 USD and fl otation or dual tires can be even more expensive. Skidders, forwarders and drive-to-tree feller bunchers all operate in the most extreme off road conditions of heat, cold, mud, rocks and abrasive soil. Rubber tires can wear prematurely (or fail catastrophically) if not properly looked after. Fortunately, by taking some simple, common-sense precautions, operators can protect their investment and get the most service life and maximum safety out of their tires. First and foremost, operators need to be checking their tire pressure regularly – preferably on a daily or at least weekly basis. Under infl ation can cause excessive heat buildup leading to damage to the sidewall, beads or lining. On the other hand, an over infl ated tire is more vulnerable to impact damage. Always check the tire pressure against the Tigercat and tire manufacturers’ service recommendations. Operator training and behavior are also both critical to extending tire life. Two particular areas that operators need to be aware of are the use of differential locks and planning for the best driving path. Differential locks provide extra traction by forcing both wheels on a vehicle to spin at the same speed rather than allowing each wheel to spin at different speeds depending on traction. Pre-emptive use of differential locks in difficult terrain (muddy, steep or dusty) helps to minimize the amount of wheel spin. Many operators wait until they notice wheel spin before using the differential locks. This can lead to severe tire damage as large pieces of rubber can be sheared off if the tire makes contact with a sharp rock or stump when spinning. Differential locks should be engaged in anticipation of difficult terrain as much as possible to minimize this risk, but should be left off for driving on less challenging terrain. Finally, operators need to select the best driving path whenever possible. Operators need to be aware of the geography in the working area and carefully plan the route to be driven. How steep are the slopes? Are there areas or deep mud or hard-to-spot hollows? Going around an obstacle or mound or steep incline may take a little longer, but the savings in fuel and tire damage may well make it worthwhile. Always keep both eyes and your mind open when driving off road.